As part of your subscriber benefits, you have access to a wide range of software downloads. You must be signed in to your subscription to access the Downloads tab. In general, all commercial and consumer Microsoft products that are relevant for software development projects are made available to Visual Studio subscribers. With Visual Studio subscriptions, products typically remain available for download long into the future — even after the extended product support period has ended — to enable customers to develop and test legacy applications and transition to newer platforms. There are cases where we are unable to provide certain products to subscribers as outlined below, but we make every effort to minimize these occurrences. The product is not included in your subscription level or program. Learn more about the software and benefits available with your subscription or download the full list of products available by subscription level. Some programs, such as Microsoft Partner Network, provide Visual Studio subscriptions as a part of their benefits. 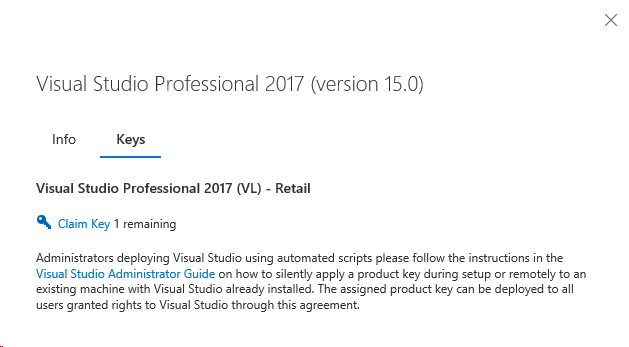 Those subscriptions do not include all products included in purchased Visual Studio subscriptions. Subscribers to these programs should direct questions about availability of product downloads to the support teams for those programs. The product is not included in subscriptions. Some Microsoft products are not included in subscriptions due to special licensing terms, technical restrictions, or developer relevance. If you would like to suggest a product be added to the subscription, please send email to your Visual Studio Customer Service Center. The product is publicly available. Some tools, SDKs, DDKs, and service packs are publicly available from the Microsoft Download Center. Some such products may not be published to Downloads. The product has not yet released. Many pre-release (beta) versions and release candidates are available from Downloads. However, not all betas can be included; for instance, some betas require special registration or eligibility. For more information about open technical beta programs, please visit Microsoft Connect. The product is not available in your country. Some Microsoft products are not available due to regional restrictions. Redundant software. 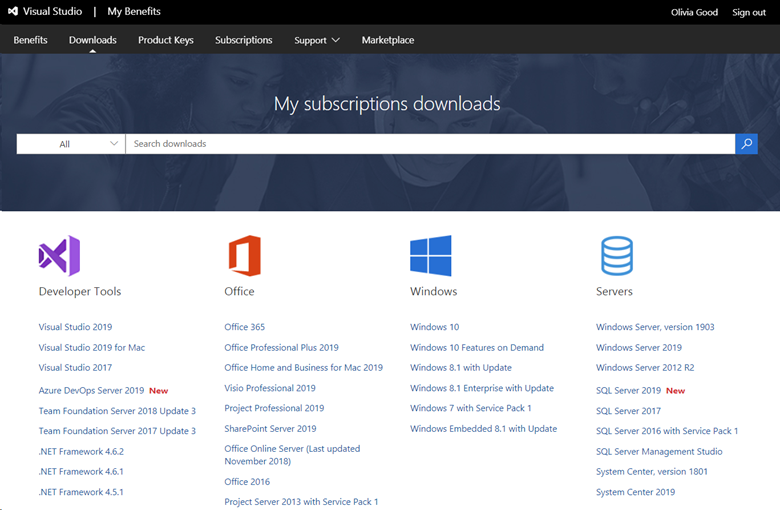 Select Office suites and standalone Office downloads and product keys are no longer available in subscriptions that include Office. Downloads and product keys are available for the corresponding highest Office suite of the same version. For example, if you search for PowerPoint 2010, the search will not produce any results. However, you can search for Office 2010 - the Office suite that contained PowerPoint 2010 - and download the suite. The number and type of downloads depends on your subscription level and program memberships. 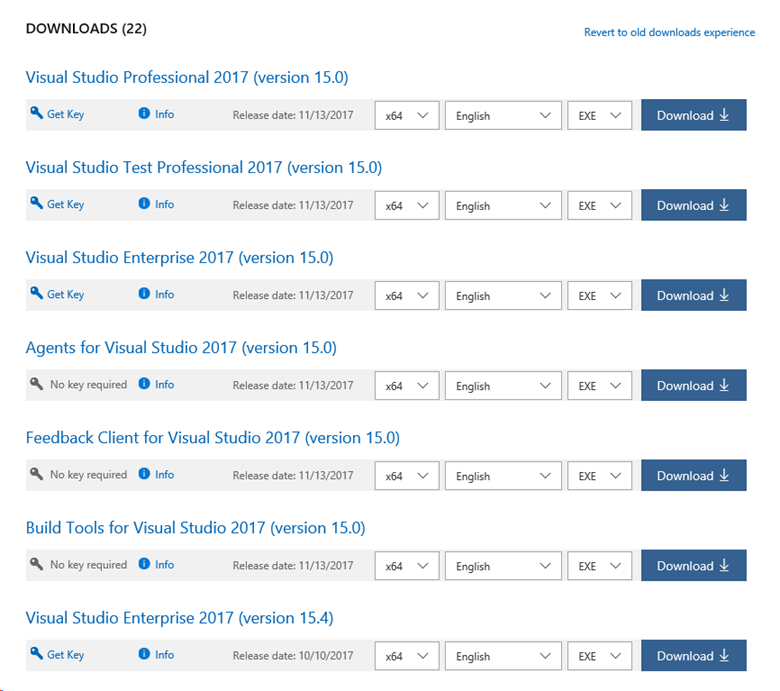 Subscribers with Visual Studio Enterprise standard subscriptions, for example, may have different downloads available to them than subscribers who obtain their subscriptions through a Microsoft Partner Network or BizSpark program subscription. To learn more about what downloads are available for each subscription level, download the list of Products By Benefit Level. How do I find downloads in the subscriber portal? Only the downloads included with your subscription are displayed for you on the Downloads page. If you have more than one subscription or program membership, the downloads shown will be for the highest subscription you hold, even if you are currently viewing a different subscription. 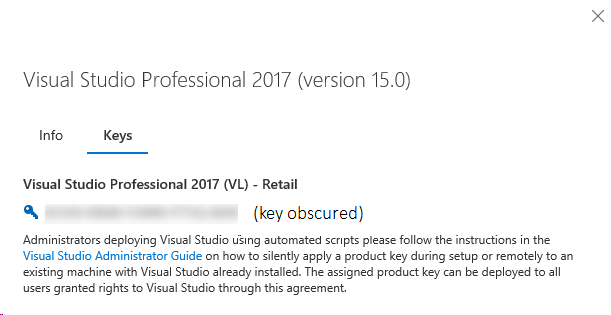 For example, if you have a Visual Studio Professional subscription and a Visual Studio Dev Essentials membership both associated with the same sign-in ID, the downloads shown will be those included in the Professional-level subscription, even if you’re currently viewing your Dev Essentials benefits. When you visit the Downloads page, you'll see popular downloads arranged in groups by product type. You can select one of the popular downloads shown, or search for any product using the search bar at the top of the page. 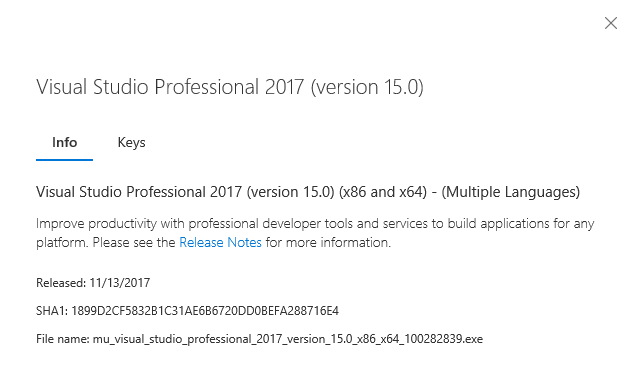 For example, if you choose Visual Studio 2017 from the Developer Tools list, you'll see a list of available Visual Studio 2017 downloads. You easily select your architecture, language and file type using the available drop-down menus. Choose your preferred options, and click Download to begin downloading the product. Clicking on the product name or on the Info link will display the details for that download and provide access to the release notes for the product. In the details pane, you can also click on the Keys tab to check the status of your product keys. To obtain a product key for the download, you can either click the blue key labeled Get Key or if you're already viewing the details pane, click on Claim key on the Keys tab.